I mentioned yesterday that my wedding anniversary is this Saturday, and I wanted to make a special card for my honey. 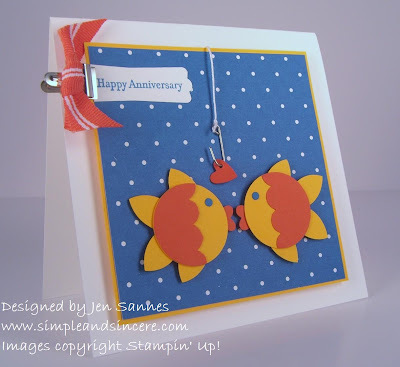 I have seen these fish made from punches on Splitcoast and I thought it would be super cute to make them kiss! I also used this week's color challenge on Splitcoast - Pacific Point, Tangerine Tango and Summer Sun. I think my favorite part is the little hook! I'm going to have to write something really cheesy on the inside, like "Even after all these years, I'm still hooked on you!" or "You have my heart, hook, link and sinker." *Wink*. I made the hook from a paper clip that I had sitting in my desk. Want to make one, too? See this post for photos and instructions. OMG! I love everything about this card! It's so cute! I will definitely have to CASE this one! Happy Anniversary to you and your hubby! What a sweet card! I love the hook also. I'm going to have to come back to visit when I get more time. Love your cards! Ridiculously CUTE! That paper clip fish hook is so clever! I love this card, so clever! thank your for sharing! Soooo cute Jenn! Great little tutorial on how to do the hook too! oh my this is so cute!I love doing punched art cards too! stop by my blog if you'd like to be entered into a drawing for a brand new set of Stampin Up Markers and carrier! This is adorable! Thanks for the inspiration! This is just the cutest card ever! What a great idea!